We’d love your help. Let us know what’s wrong with this preview of The Truth as Told by Mason Buttle by Leslie Connor. To ask other readers questions about The Truth as Told by Mason Buttle, please sign up. what age is this book good for ? Ellen I would say fifth and sixth grade. It would be a brilliant read-aloud for a class. Friendship, family, love and loyalty are all baked into this beautiful, sweet wonder of a book. And Mason. Mason Buttle is the sweetest, sweetest boy ever! He says things like “Holy Cow!” and stands by his friends and always tells the truth no matter what. 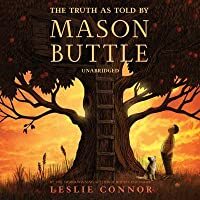 This big, unforgettable cutie tells his story in his own unique way in Leslie Connor’s The Truth As Told By Mason Buttle. Twelve year old Mason Buttle has had some hard luck lately. And when I say lately, I mean the last five or six years. The whole Buttle family has been hit. Mason lost his Gramps, then his Mom, and then his best friend—Benny. Bam, bam, Boom! All in a row. Throw in a police investigation into Benny’s death and having to sell off some of the family orchard and….well the Buttle family is barely keeping it together. You can feel the down mood in every dusty, crumbled down corner of their home and hearts. But Mason is still out there trying and living every day. In an honest, sweet, big-hearted voice, one of the most loyal and loving kids in print comes to life. You have to meet this kid! There is a lot going on here. We have a couple of mysteries to solve, bullies to run from and hopefully stand up to, grief & depression to battle, hope to find, and learning disabilities to learn about and work with. Ms. Blinny, a teacher and powerful source of peace and understanding for Mason, is a glittery super star in my book and this one! A hero! The way she gives these kids a safe haven to be themselves in is a joy to see. Every kid needs a Ms. Blinny in their world. And a Calvin! Tiny Calvin Chumsky and big Mason Buttle make an unstoppable team. A friendship that learns and teaches new things, inspires projects to do, and provides support and comfort against the teasing and apple tossing bullies in town. But when Calvin goes missing, trouble and bad luck comes a’knocking on the Buttle door once again. Can they survive another hard luck hit? I’m not saying. You’re going to have to pick this one up to find out. I will say this though--you’ll be rooting for this whole gang from start to finish. I’m very happy I met Mason. There was a slow patch in the middle of this book that almost beat me. But boy-o-boy am I happy I kept reading! I was rewarded with a happy, tear filled ending! The way Ms. Connor put this puzzle together piece by piece is absolutely brilliant. Pieces like vantage points, gravity, light shafts, colors, Houdini dogs, and apples all come in to play! At one point, I found myself asking what does this have to do with anything? Well just pay attention because it all fits together. The magic just builds and builds as the pieces of the puzzle start click, click, clicking together! You have to read this book! A quiet, warm, charming story filled with all the good things in life. A story that shows that we often have to work through hard times to get to the joy in life. Mason's voice reads so authentic and naively honest. It's apparent this character was born from a very loving place in author Leslie Connor's mind. You want to teach him so much but at the same time, want to shield and protect him from so much. A warning: This book is surprisingly dark and heartbreaking. Mason is bullied relentlessly and while he doesn't let it shake him, I wanted to climb inside the pages of this story multiple times and show Matty Drinker a thing or two! The relationship betwe Mason's voice reads so authentic and naively honest. It's apparent this character was born from a very loving place in author Leslie Connor's mind. You want to teach him so much but at the same time, want to shield and protect him from so much. A warning: This book is surprisingly dark and heartbreaking. Mason is bullied relentlessly and while he doesn't let it shake him, I wanted to climb inside the pages of this story multiple times and show Matty Drinker a thing or two! The relationship between the boys (both predators and prey) is very complex and difficult to read play out because I'm afraid it's SO realistic. I'm not sure the lack of a resolution for a particular plot thread will suffice for readers who wish to see justice fully served. Personally, I would have settled for just a little bit of accountability out of a certain character, but none is shown. I had high hopes (mostly because of it’s stunning cover) that fell flat. Okay storyline, but it was too advanced for an early reader, and too childish for a young adult. Regardless, it took me foreverrrr to get through. This review has been hidden because it contains spoilers. To view it, click here. I really have massivel enjoyed being taken by Lesley Connor into Mason Buttle's world, into his mind and innermost soul. For Mason, he is such a sweetly conceptualised character, a person with simply a humungous and all-encompassing loving heart, who despite his family's many recent and not so recent tragedies, his serious learning challenges, his constant fight against and fear of relentless bullying both at and after school and that in spite of his universally known penchant for always telling I really have massivel enjoyed being taken by Lesley Connor into Mason Buttle's world, into his mind and innermost soul. For Mason, he is such a sweetly conceptualised character, a person with simply a humungous and all-encompassing loving heart, who despite his family's many recent and not so recent tragedies, his serious learning challenges, his constant fight against and fear of relentless bullying both at and after school and that in spite of his universally known penchant for always telling the whole truth and nothing but the truth the police and in particular Lieutenant Baird still keep hounding and not really believing Mason regarding the death of his best friend Benny Kilmartin in the Buttle family orchard still manages to face each day honestly, courageously and with a hopeful belief that things might get better (even after his new best friend Calvin Chumsky also disappears for a while and once again Mason is being questioned and viewed with mostly and sadly suspicion by the police). Now I do well realise that there are some readers (and perhaps even a sizeable minority) who have likely been angered by the fact that in The Truth as Told by Mason Buttle, the ending does not feature main bully (chief antagonist, villain) Matty Drinker coming either to any type of understanding regarding his nastiness (and what his behaviour has wrought) or indeed being arrested and officially charged (with at the very least criminal negligence) regarding Benny Kilmartin's death (after Mason's missing handsaw being discovered hidden in the Drinker family's garage clearly presents that it is Matty who sawed through the rung of the Buttle orchard playhouse ladder and caused Benny to fall to his death). But in my own humble opinion, that same ending is in fact while of course painful and aggravatingly infuriating also for all intents and purposes woefully realistic no matter what naysayers may claim to the contrary. And I for one do very much applaud Lesley Connor's honesty and realism, as more often than not in the real world, in real life, vicious bullies like Matty and his cabal of equally vile acolytes are shielded and enabled by not only their families but also by inactive, passive and unwilling to interfere teachers, school officials and yes indeed in The Truth as Told by Mason Buttle also by the police not immediately pressing charges (when it becomes abundantly and totally clear who and what actually has caused Benny's demise). For while yes, of course, I totally would have wanted Matty Drinker facing criminal consequences for causing Benny to have his fatal fall from the playhouse ladder, the fact that he and his mother are able to skedaddle out of town and that the police do not really seem all that willing to pursue the matter any further either is in fact and indeed how often bullying and even violent episodes of the same are allowed to spread and fester, enabled and sometimes even condoned by adults, by supposedly good and decent deemed individuals like teachers, police officers and the like not doing enough, not wishing to rock the boat, not wanting to create more issues, fissures etc. (although I do indeed question a bit why Lieutenant Baird is so constantly hounding Mason about Benny's death, not believing him, but when it then becomes obvious at the end of The Truth as Told by Mason Buttle that Matty Drinker is most certainly the main culprit, is the person who obviously caused and precipitated Benny's fall, that he and his mother do not have all that much difficulty skipping town and removing Matty from the limelight of suspicion and that the police is also not all that willing to now pursue the Drinker family and in particular Matty in the same way that Lieutenant Baird had previously been hounding the Buttles, and especially Mason). This review has been hidden because it contains spoilers. To view it, click here. Tell you what, there is lots to like about this story: Mason, Mason's voice, his relationship with Calvin, the dog, the school counselor. But there are lots of jangly threads that don't work: the agonizing slow pace, lack of forward momentum, the weirdly executed police investigation, the lack of motivation and remorse of the flat-out evil bullies, and the forced coincidence that got them all in the garage at the same time. From the author of All Stand for the Honorable Perry T. Cook, this book has an equally sincere young narrator in Mason Buttle. A heartbreaking story about tragedy and misunderstandings with a very satisfying ending. Ages 10 and up. “Some people might think they already know my story. That’s just because they live around here. Some stuff is plain. Some stuff is right where you can see it. If you lived in Merrimack you might know our place. It’s the crumbledown house out on Swaggertown Road. Sits a good bit of acres that used to be a whole lot more. Developers. My Uncle Drum says we can’t live without them. My grandma says we should have tried. You might know our orchard. You might remember it looking alive as a hive late in the summer. PYO. Pick Your Own. If you are like me your eyes about pop out of your head at how quick the developers dozered down the trees. They are still building. New houses. Up the hill and down the hill from our place. You might look at our house sitting in the middle and wonder why it looks like somebody emptied a dustpan over it. I try. I sweep up the porch. Pull weeds in the front. But I am now and then about it. I don’t keep up. Uncle Drum says just leave it. Then another shingle drops off the roof. Lands in the yard. Mason Buttle struggles in school and he lives on a derelict Apple farm with his grandmother, his unemployed uncle and Shayleen, a depressed young girl with a shopping habit. Mason is also horribly bullied by Matt Drinker and Lance Pierson. Worst of all, Mason’s best friend, Benny Kilmartin died just over a year ago and Lieutenant Baird won’t stop asking Mason questions about it. Things are turning around, though. 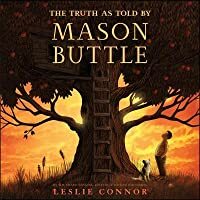 Mason has the unwavering support of Ms. Blunt, the school social worker, and a new friend, Calvin, along with the loyalty of his neighbor’s dog who really likes Mason best. Can Mason find out what happened to Benny and redeem himself? I started this last night and finished it this afternoon during lunch (I was probably the only one at the tech conference hiding in a corner with a book!). I completely fell in love with Mason, his friend Calvin and sweet Moonie the dog. About halfway through I realized I wanted to read this aloud to my 6th grade lunch bunch and I immediately emailed the author to set up a @Skype visit. This book just begs to be read aloud—I can’t wait to talk about it with students. 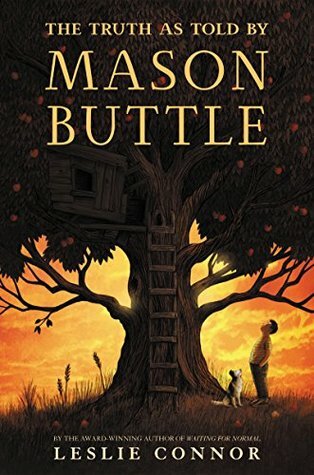 MASON BUTTLE is a mystery, but first and foremost a book about believing in oneself and finding redemption. I’m not surprised by how much I loved this book—I regularly recommend @heyleslieconnor other books, especially WAITING FOR NORMAL, which I personally loved. Put this one on your order lists if you haven’t already! Great for grades 5+. “You should know. There has been a lot of bad luck. Around me. Like, it follows me.” This quote perfectly sums up the young life of Mason in @heyleslieconnor’s latest book The Truth as Told by Mason Buttle. Mason stands out in his grade, not only because he is the biggest and sweatiest, but he can hardly read or write. Add to this the never-ending bullying by some neighborhood boys, his grief over the death of his best friend, Benny, a little over a year ago in Mason’s family’s orchard, and the “You should know. There has been a lot of bad luck. Around me. Like, it follows me.” This quote perfectly sums up the young life of Mason in @heyleslieconnor’s latest book The Truth as Told by Mason Buttle. Mason stands out in his grade, not only because he is the biggest and sweatiest, but he can hardly read or write. Add to this the never-ending bullying by some neighborhood boys, his grief over the death of his best friend, Benny, a little over a year ago in Mason’s family’s orchard, and the constant hounding by the local police that Mason knows more than he is telling about that tragic day. A new friendship with a boy from school, Calvin, is making everyday life a little easier for Mason, especially when the boys create a secret hideout away from the bullies. But when Calvin goes missing, Mason finds himself back in a situation that’s all too familiar. Will Calvin be found or will the string of bad luck surrounding Mason continue? You know when you have a book on your TBR pile for a while and you finally get to it, read it, and then think, “Why on earth did I wait so long to read this?” That’s me. Right now. With Mason Buttle. I’m deathly afraid to give away any spoilers, but suffice it to say that this book is a MUST for any personal, classroom, school, or public library. It is a book about kindness, empathy, honesty and, most importantly, looking at “intelligence” and through a new lens. Trust me. Read it. You’ll not be You know when you have a book on your TBR pile for a while and you finally get to it, read it, and then think, “Why on earth did I wait so long to read this?” That’s me. Right now. With Mason Buttle. I’m deathly afraid to give away any spoilers, but suffice it to say that this book is a MUST for any personal, classroom, school, or public library. It is a book about kindness, empathy, honesty and, most importantly, looking at “intelligence” and through a new lens. Just a fabulous story with Mason Buttle as a lovable and complex character. I think that older struggling readers can relate to Mason's struggle to read and be heard. I see this book with a medal on the cover! I also LOVED Leslie Connor's book "Waiting for Normal." Books like these remind us to listen to and respect the children we encounter. I was frustrated because I got more than more than halfway through this audiobook and then my loan expired. I had to wait a couple of weeks to borrow it again. The narrative is very interesting and provides some insight into the mind of a young man whose mind works a bit differently than most. What a beautiful story of friendship, truth, and empathy. The book's setting felt really close to home for us as we reside in New Hampshire. We felt so connected to Mason and Calvin. This book is truly relevant to our students today and I am so glad that we read it together as it brought up many life lessons! We finished today! I had to hold back my tears as we found out the truth of what really happened to Benny Kilmartin. What a journey this book took us on! I can't wait to read it to my class What a beautiful story of friendship, truth, and empathy. The book's setting felt really close to home for us as we reside in New Hampshire. We felt so connected to Mason and Calvin. This book is truly relevant to our students today and I am so glad that we read it together as it brought up many life lessons! Amazing book - because it’s written in the voice of Mason Buttle, the largest and sweatiest boy in his class, who has trouble reading and a heart of oak. He is stalwart and loyal, and doesn’t realize that he is suspected of a crime, which makes him something of a pariah. His lack of comprehension mirrors the reader’s as we slowly unravel the facts and pick up clues before he does. His team of supporters - the special needs teacher at school, his uncle and grandmother, and his new best friend Cal Amazing book - because it’s written in the voice of Mason Buttle, the largest and sweatiest boy in his class, who has trouble reading and a heart of oak. He is stalwart and loyal, and doesn’t realize that he is suspected of a crime, which makes him something of a pariah. His team of supporters - the special needs teacher at school, his uncle and grandmother, and his new best friend Calvin, also an outlier in the school hierarchy because he’s smarter than the others - support him throughout. And there’s Moonie, the neighbor’s dog, who prefers Mason over his unkind owner. All in all, a completely convincing character whom we come (very quickly) not just to love, but to respect for his loyalty and inability to tell a lie. Mason Buttle has such a unique voice. I thoroughly enjoyed the characters in this story. Ms. Connor has a wonderful way of speaking to the inherent humanity of differently abled people. I loved Mason and his friend Calvin's spirit of ingenuity and fun. Although, the story is complex, Mason uses his words to communicate in clear terms his love for his family and his friends. This is a great title for fans of realistic fiction. Oh, how I loved this story!! This is on my favorites shelf. I loved everything about this... a main character I loved and found myself rooting for, a loyal best friend, a faithful dog, a horrible bully, and a story I didn't want to put down because I HAD to know what happened. Mason reminds me a bit of Forrest Gump (but sweatier!)... innocent and lovable and funny. This would make a great movie. Thank you, Leslie Connor for this wonderful story! This book grabbed me and would not let me go. Mason Buttles will live in my heart for a long, long time. Wow! Couldn’t stop reading about Mason and his incredible personal journey. This is a new favorite! This book gave me the sads. Mason Buttle, Mason Buttle. He is a character with shades of Lenny from Of Mice and Men. Big and strong, but gentle. He is self-deprecating (calling himself a "gross out" because he sweats excessively). He can't read. He is trusting to a fault (thinking the best of a kid who ruthlessly bullies him). He seems to be surrounded by a cloud of bad luck and death (his mother and his best friend both die tragically). He has synesthesia that makes him see colors related to hi This book gave me the sads. Mason Buttle, Mason Buttle. He is a character with shades of Lenny from Of Mice and Men. Big and strong, but gentle. He is self-deprecating (calling himself a "gross out" because he sweats excessively). He can't read. He is trusting to a fault (thinking the best of a kid who ruthlessly bullies him). He seems to be surrounded by a cloud of bad luck and death (his mother and his best friend both die tragically). He has synesthesia that makes him see colors related to his feelings, but he's afraid to talk about it for fear of being ridiculed. Things start looking up for Mason when he makes a new best friend and his school counselor introduces him to voice-to-text software that allows him to keep a journal of sorts. He is still bullied and still under investigation for the death of his friend, but with this new friend he starts to have fun. They build a fort and bond. Then the story gets sad again. I almost couldn't take it. Poor, sweet Mason Buttle. Fear not, readers, for our Mason does get positive resolution (I guessed the ending pretty early in the book, but I think kids will find it very satisfying when it's revealed). But it's a long slog to get there. I really really liked this book a lot. I was worried that it would be too juvenile for me but I really felt Mason and his character. Everyone in this book was so real! There are so many things that I liked about this book. Ms. Blinny - she is amazing! The apple orchard - what a great place to grow up! Moonie - the friendship between Mason and Moonie is simply amazing! “I watch that dog. He hits the ground running and he does not stop. He comes at a gallop straight up through the orchard. Smiling jaw. Pink tongue. I run downstairs. Open our door. There he is standing on the plywood. Waiting for me. Marching steps. Wagging tail. And the thin color of raspberry pink all around him. This was a lovely, endearing read about a kid with both dyslexia and synesthesia whose best friend died. The mystery of what happens slowly unfolds as the character processes and heals from the event, and it feels so tender the whole time. It’s written to be right on the brink between middle grade and young adult, and reminded me more than once of “Wonder” by RJ Palacio. This story will stay with me for some time along with its main character, Mason Buttle, whose perseverance, kindness and integrity are truly inspiring. It's a heartbreaking read but one of those that carries so much light along with it. I loved Mason and wish I knew him in real life! He's sweaty, often bullied, huge and all heart. I have absolutely fallen in love with Mason Buttle! It is hard not to. Mason is such a pure and honest character. A very refreshing and inspiring change. The Truth as Told by Mason Buttle follows the life of Mason two years after he experienced a terrible accident. Every so often the lieutenant comes to visit Mason, ask more questions, and to read what Mason has written in the notebook he was given, the only problem is that Mason does not know what happened and even if he did, his dyslexia preve I have absolutely fallen in love with Mason Buttle! It is hard not to. Mason is such a pure and honest character. A very refreshing and inspiring change. The Truth as Told by Mason Buttle follows the life of Mason two years after he experienced a terrible accident. Every so often the lieutenant comes to visit Mason, ask more questions, and to read what Mason has written in the notebook he was given, the only problem is that Mason does not know what happened and even if he did, his dyslexia prevents him from expressing his ideas in writing. Mason's social worker, who always has great solutions for him, introduces Mason to the Dragon, which changes everything for him. There’s a scene at the end that almost bumped it up to 4 stars but I gotta stick with my gut. Great voice but too long and a little unfocused. Leslie Connor always creates memorable, rich, and realistic characters and engaging, thought-provoking stories for them to be a part of. I love Mason Buttle and think every middle schooler should read his story.